Yesterday I answered that ever-so-popular question: Can I Make Money Blogging. If this is a question that has been plaguing you, I think you would enjoy hopping over to that post first before you come back and finish this one. We established that if you are willing to make the time and money commitment and if you stay true to who you are, the money is very likely to start coming in. But you are probably still wondering how, right? There is a reason why you don’t see the answer to this question in neon lights all over the internet. It really isn’t a one-size-fits-all answer. The answer to this question is different for each blogger. Some make large amounts of money one place while others make very little in that same place. Which leads me to the most important thing that anyone needs to learn as a blogger: It’s easy to play the comparison game, but it doesn’t measure up that simply in the blogging world. I’ve learned this lesson many times over and over again and sometimes I still catch myself. You hear that your friend is making a ton of money off sidebar ads and you just don’t understand why you aren’t making money there! There are a millions blogs out there. If you don’t focus on being yourself—> you are going to turn out to be a nobody. So, with that said, I will share what works for me, as long as you promise to use it only as a tool to help you be the awesome you that you already are. Don’t keep looking for one right formula or some perfect number of pageviews. You can make money without either of those. Just look for what works for you and your readers! As we established yesterday, there are 4 main ways that bloggers make money: ads, affiliate sales, sponsored content, and product sales. Go back and read about those if you don’t understand what they are. My LOWEST percentage of income comes from affiliate sales. Of course, this hasn’t always been the case. A few years ago, this was my ONLY source of income. It’s much easier than developing your own products and it helps someone else out. Almost every company has an affiliate program, from Amazon to Gymboree. I do use affiliate links for some of the large companies, but more often than not, I use smaller companies. In fact, I tend to make more money as an affiliate for another blogger than I do for a major brand. Of course, remember every blog is going to be different. I’m sure that a deal blogger will not rank affiliate sales as the lowest source of income! Isn’t it great that we are all so different? If you are looking for large companies to work with, I would suggest Amazon, Shareasale, and CJ affiliate to get you started. Then look around and find bloggers you love and sign up for their affiliate program (I have one here). Basically, if you love a company, dig around and see if they have an affiliate program. I know plenty of bloggers who feed their family entirely with ad networks. I don’t. My readers have never been especially fond of those little flickering ads. With Google Adsense, I was making virtually nothing. A few months ago, I signed up with a network that does DFP and I can not say enough good things about them! With the Blogger Network, my ad revenue increased by 10x as much! If you are finding that your Adsense numbers are pretty low, this might be an option for you, too. Premium networks generally require at least 100,000 pageviews per month, with some requiring at least 750,000 pageviews. I think I’ve mentioned it enough already, but I’ll say it again. Every blogger is different. 6 months ago, my sponsored content income was at a big fat ZERO. Part of this was because I am very careful about what I am willing to write about on my blog. However, I do enjoy working with the Savings.com sponsored content team. Their post ideas and campaigns fit my audience very well. I do bring in some income from time to time writing for them. However, the biggest source of sponsored content is eblasts. The concept is simple. I share great email content with my readers and they get something wonderful in return. Last, but nowhere near least, is product sales. This category has actually been my top income source for over a year now. In fact, it’s about 75% of my income on average. Naturally, the more products I create, the higher that threshold goes. The best part is that I LOVE creating products. I love meeting the needs of families out there who want reliable and wholesome solutions to their everyday issues. And of course, I don’t necessarily have to be here on the site when someone comes to purchase from me. That is a beautiful thing. There are fees associated with digital products and some creation costs, but often times, the profit margin is still very high. This is wonderful for me because I can’t always get a new blog post written every day. I rely heavily on product sales income. But again, I have many friends who don’t have any products (or only have 1-2). In that case, this category would be a much lower percentage of overall income. Another great option for newbies is How to Blog for Profit Without Selling Your Soul. This book is a fantastic resource and Ruth is a great teacher, as well! You can buy a domain name just about anywhere, but I am not a fan of the business practices of some of the options out there. I switched over to Name Cheap a few years ago and haven’t looked back. They don’t try to sell you junk you don’t need. It’s a perfect fit for me! Hosting is one of those things that will make or break you. When someone shares your pin on Pinterest, you are going to want to make sure your host can handle that traffic. I have used a few options out there that I would strongly steer you away from. My favorite? 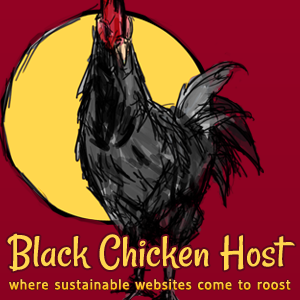 By far, I prefer Black Chicken Host. Their customer service is outstanding. If you are a newbie or even just someone who prefers not to have to know a lot about the technical side, you will LOVE Black Chicken. Plus, they are very reasonable. I send a weekly newsletter to my subscribers. This is vital to my business, because it’s the best way to communicate with my readers. Social media is not reliable in the long run, as it may change. 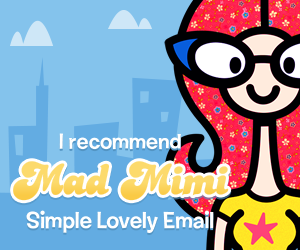 Mad Mimi has been my preferred email provider for nearly a year now. Their customer service is top notch (noticing a trend?). I also find their interface easier to use than many of their competitors. I will say that it doesn’t automatically integrate with some plug-ins, such as WP eStore. But, there is always a fairly simple way around that. To me, it’s well worth it to have a much more user-friendly email service! I get almost all of my photos from stock photography companies. Beautiful photos matter, trust me. Occasionally I take photos of my kids actually doing something that I am writing about, but my photography skills are lacking, so I try not to do this too much! 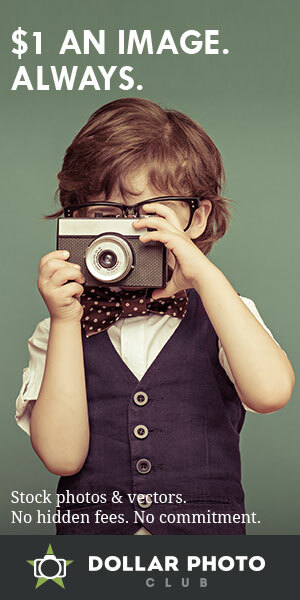 My favorite stock photography site is Dollar Photo Club. Their photos are excellent and I rarely have trouble finding something I’m looking for. They are also just the right price- $1. I prefer to pay for the package deal because it’s the easiest. The other most common question I get is about my store. It’s built on the WP eStore platform. This includes my affiliate program. EStore is a hefty plug-in and it’s not cheap, but it’s perfect for the job. The good news is, it’s fairly easy to use and there is plenty of support for those of us who consider ourselves less than techie. So how about you? Got any favorites? Tips? Comments? Thank you for writing this post. I am just starting the blogging adventure and am so grateful for bloggers like you who will share their success with others. Very interesting…I’m new here and I do love blogs! I had never thought about doing one myself until now. In a few short months, my 40 something self will be walking away from a high paying, long time corporate career to be a stay at home, homeschooling mom out in the sticks. Talk about a total lifestyle change. Some great info and lots to think about…..thanks for the article! Wow! So much goes into blogging these days. I had to abandon my blogs yrs ago for security for my adopted baby, but I do miss it a lot. I never thought to make blogging a career. As a single mom I can see how it is an ideal income supplement. Of course if I were a full-time blogger i’d like to believe that my posts would be as informative, creative, and encouraging as yours. (I know I wouldn’t come close;) ) I have been at this single parent thing much longer, yet you have taught me soo much. You have an amazing gift 🙂 Not Consumed is my favorite mommy blog. Thank you for sharing such valuable information. Aww…thank you for your sweet words! Wow! Thank you for this post. You very well may have just saved me a great deal of money on transferring my home o school blog to WordPress and get a domain name for it. Thank you, thank you, thank you. Thanks for this post! I read so many posts on blogging and soo many of them all say the same thing. Glad to hear of some new resources and fresh perspective. Thanks for sharing. Thank you so much for what you do! I am a single mom of three sweet boys, a 6 yr old and twin 3 yr olds. Long story short my life has been a rollercoaster the last few years but God has walked, and sometimes carried me though, He has truely turned what was meant to destory me around for His glory and for mine (and my boys) good! I was approched by some friends at church a couple years ago about writing a blog for their online paper about life as a mom and wife not long after my ex-husband walked out. I feel like God has put it on my heart to start a blog but I am not good with computers at all! I had to google what a domain name was! lol Anyway I found you though pintrest and could believe what I was reading, it’s like God was like here, it’s all laid out for you! I just wanted to say thank you for your obendience to God, you have inspired me!